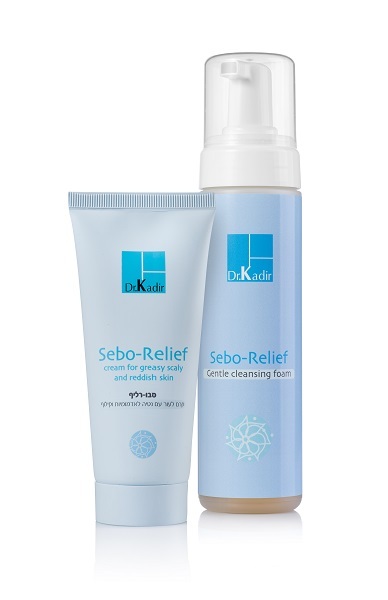 is a disorder particularly affecting the sebum-gland rich areas in the face, the scalp and other areas. This condition may appear at any age after puberty in various degrees of severity and affects 3-5% of the population. Lesions are common in the eyebrows, on the edges of the eyelids, behind the ears and both sides of the nose. It can also result in pale pink patches on the hairline. The condition is often aggravated by psychological stress, fatigue, change of season (in winter and early spring), illness and poor general health. Seborrhoeic skin is believed to be an inflammatory reaction related to the presence of a yeast called “Malassezia” which is a normal skin inhabitant. The organism is probably not the direct cause of this condition but a cofactor linked to increased sebum levels and an other factors. In normally-functioning skin the yeast causes no incident but in individuals with reduced resistance, the epidermis responds unfavorably to the infection, it becomes inflamed and shedding large scales of skin. The contribution of the yeast may come from the release of inflammatory fatty acids from the sebum by its enzymatic activity. The pink flat patches with the loose scales may or may not be itchy and can change from day to day. There is no way to prevent this condition completely, however, it can be controlled quickly with appropriate treatment. The cream has a specially light texture, it is instantly spread and absorbed by the skin and leaves no greasy feel. Avenanthramide (hydroxyphenyl propamidobenzoic acid)- There is a strong evidence in the scientific literature regarding the potential anti-inflammatory effect of avenanthramides. Avenanthramides is a group of compounds only found in oats, with strong anti-allergenic, anti-inflammatory and anti-oxidant activity. Clinical studies show that topical application of very low concentrations of Avenanthramides (2-50ppm) reduce significantly allergic reaction in the skin such as itch and redness. The cream contains also Aloe vera Leaf Juice and Panthenol(pro-vitamin B5)for their skin calming and anti-inflammatory action. organic sulfur bond to amino acids - These compounds have a sebostatic functionality normalizing the spread of sebum on skin. Niacinamide (vitamin B3)- Topical niacinamide was found effective in treating reddish skin . Reduced sebum levels after 2-4 weeks of application was reported in the scientific literature. Zinc – Many scientific studies indicate that zinc compounds can reduce the quantity of skin-surface sebum. The sebo-suppressive effect of topical zinc is probably related to its antiandrogenic activity by the inhibition of a specific enzyme(5 alpha-reductase). Also the inhibitory effect of zinc on the release of inflammatory fatty acids from sebum, by microorganisms, was demonstrated. Farnesol is a compound found in a large variety of plant species such as lily, jasmine, rose, chamomile, green tea and many more. Farnesol posseses bacteriostatic and fungistatic properties. Its role in this product is to control the activity of the yeast involved in the creation of skin redness and scales. This cleanser is based on a special gentle mixture of foaming agents. It contains oat extract with effective skin calming effect. The product is therefore, most suitable for the sensitive, irritated and reddish skin.